OperaFest offers an upscale silent auction, fine dining, music and a delightful evening of live opera entertainment featuring singers from the upcoming One Act Operas, Bastíen und Bastíenne and A Musical Evening at Choufleurí’s. Dine with regional, professional opera singers and experience the beauty of live opera in an intimate setting, Saturday, March 23rd. 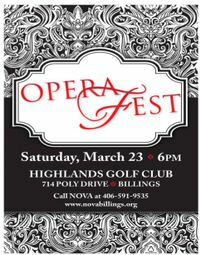 NOVA Center for the Performing Arts will host the event at the Highlands Golf Club, 714 Poly Drive, Billings, Montana. Festivities begin at 6:00PM with hors d’oeuvres and no-host cocktails, followed by a gourmet dinner with select wines. Attire is as formal as the guest wishes.